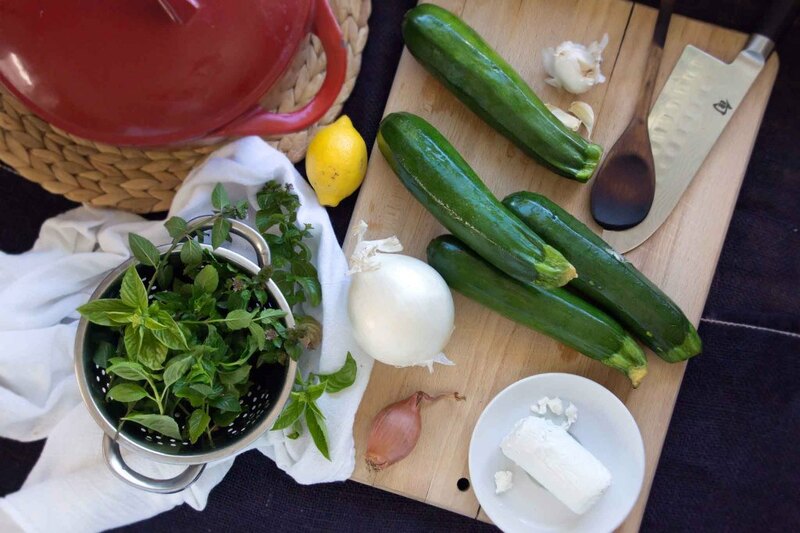 The ingredient list for this soup is very short–just a few zucchini, a log of chèvre, an onion, a clove of garlic, some stock, and a squeeze of lemon. You’ll need some fresh basil and mint, a shallot, and sliced baguette if you’re going to garnish yours as I did mine. 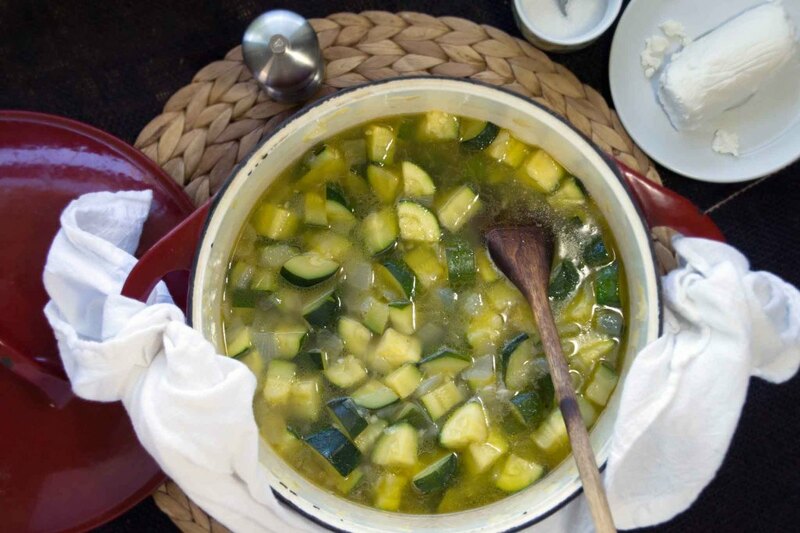 Sweat the onion and garlic down in butter and olive oil, then add chopped zucchini and simmer with stock until tender. While the soup’s simmering, you can get your garnish game together. Buzz basil, mint, shallot, and olive oil to make a zippy herb oil and smear it on slices of toasted baguette. 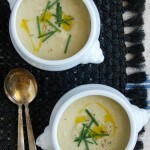 When the zucchini is totally tender, puree the soup until smooth. 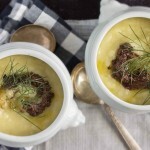 Stir in crumbles of goat cheese and brighten with a squeeze of lemon. 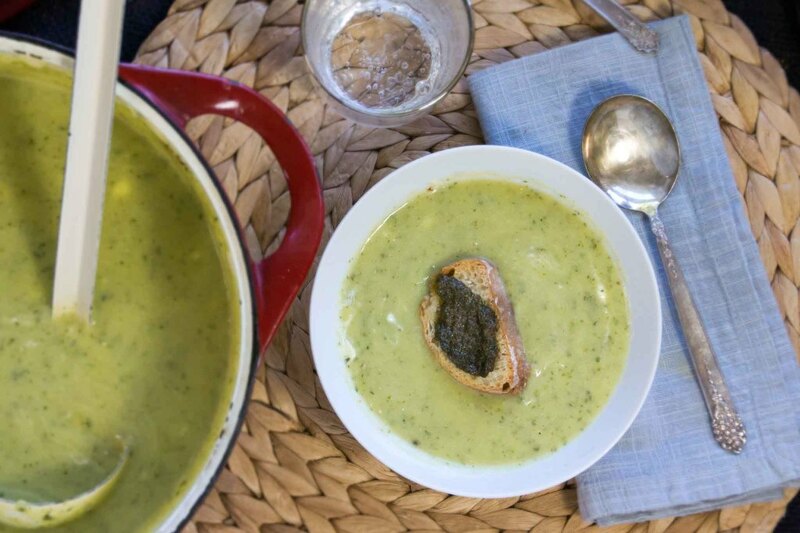 Ladle the soup into bowls, top with a couple of basil-mint croutons, and grab your spoon. 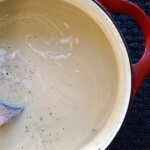 You’ll love the color and consistency of this soup; it’s a beautiful pale green with dark flecks, light yet luscious. And even though it’s hard to give up summer, a soup like this is just the thing to help us ease gracefully into fall living. 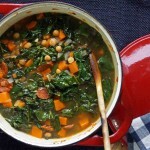 In a large soup pot or Dutch oven, melt 1 Tbsp. butter with 2 Tbsp. olive oil over medium heat. Add the onion and garlic. Season with about ½ tsp. salt and allow to sweat down until the onion is soft and translucent, about 10 minutes. Add the zucchini and season with a little more salt and continue to cook until the zucchini softens, about 10 minutes over medium heat. Add enough stock to cover the vegetables, bring to a boil, then reduce to a simmer. 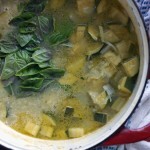 Simmer, partially covered, until the zucchini begins to fall apart, about 20 minutes. Meanwhile, preheat the oven to 400°. Place the baguette slices on a sheet pan and bake until golden and crunchy. Combine the herbs, chopped shallot, and ¼ c. olive oil in a mini food processor or blender and process into a thick paste. Season with salt and pepper. Puree the soup using an immersion blender or food processor. Crumble in the chèvre and stir, letting it melt into the soup. Taste. Season as needed with salt, pepper, and a squeeze of lemon. Gently reheat, if necessary. Ladle the soup into bowls. 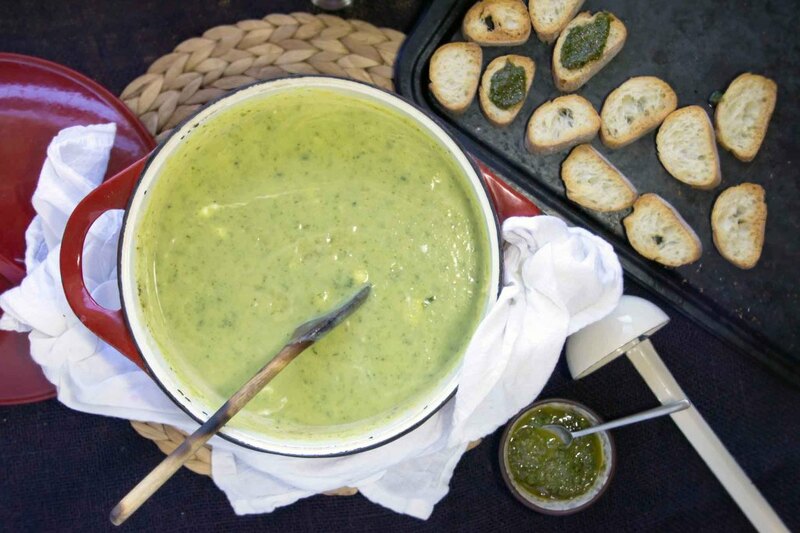 Spread the basil-mint oil on the toasted baguette and float a couple of the croutons in each bowl. Oh, I do like the idea of adding the chèvre and the croutons – what a great finish.